Growing up, if you had told me that I'd live in a house filled with braided rugs, I would've laughed and said no way. Too old fashioned. Ironically, as an adult, my tastes and needs have changed and I've become the queen of braided rugs. One became two, two became four and now I think I have multiples in just about every room. While I love the clean, classic lines of wood floors, there's something cozy about a rug, especially in winter. However, for someone with allergies and a cottage style aesthetic, choosing an area rug can be a challenge. Wool, nylon, jute and low pile fiber rugs make me itch, sneeze, wheeze and they off gas terribly. Plus many of the styles don't fit with my decor. They're too modern or too square. And I don't like hard edges. 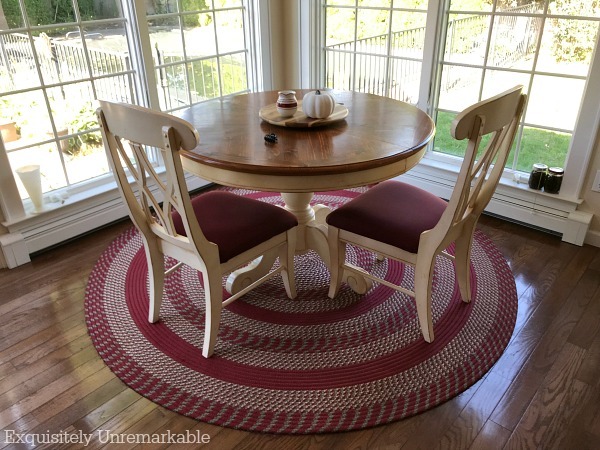 Thankfully, when decorating our first home, I was reacquainted with braided rugs. 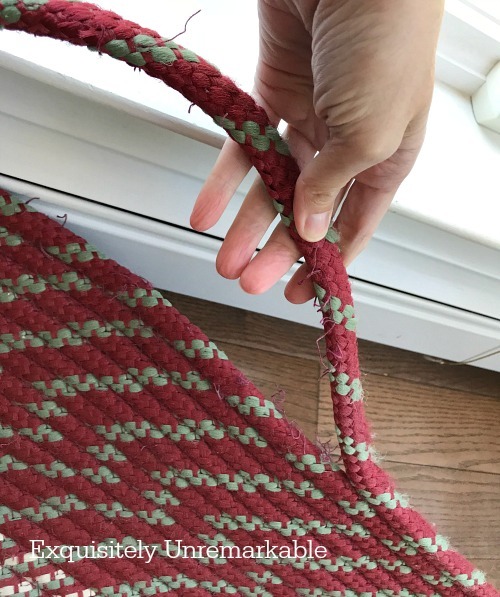 They came in lots of colors, lots of sizes including round and oval, and many different materials like cotton, chenille and indoor/ outdoor fabrics, which are great for under a table full of messy eaters...super easy to clean. I chose this one many years ago, when we added the kitchen. It fit perfectly, played nicely with my allergies, came with coordinating pieces and, best of all, the price was right. Several years later though, it began to feel heavy in the room. 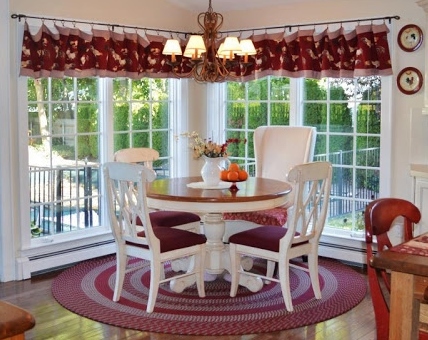 When I removed the dark valances and the chandelier lost its shades, I decided that rug had to go, too. And I was totally content with my decision for a few more years. Especially during the summer...but this year, as fall approached, I began to crave the softness of a rug again. My original thought was to haul the old one upstairs, but then I looked back at my blog pictures and eh. I liked that rug, but I'd been there and done that. Plus, I never loved the green elements in it and after being without a rug for so long, I didn't want to go back to one that large. To be honest, it was never optimal, we had to shove a decent portion of it under the radiator. Time to shop. Back to the drawing board. And my old rug. I decided the only thing really wrong with it, was that it was too large for the space. Well, that and the green border. So I cornered the big guy. I was thinking of bringing the old rug back up into the kitchen. Ok...I thought it was too big. It is. But I think I can cut it down. You can cut it down, or I can? Yeah. I know what that means. He was only partially right. I did my share. And it turned out great. I'm totally in love with my brand new old rug. The process was super simple...and I do mean it this time...but since I couldn't find anything about it online, I've decided to share what we did. I'm also sharing because sometimes when people see rugs at yard or thrift sales they pass them up because they're not the right size. Perhaps with this idea in mind, you'll reconsider and bring home a bargain. 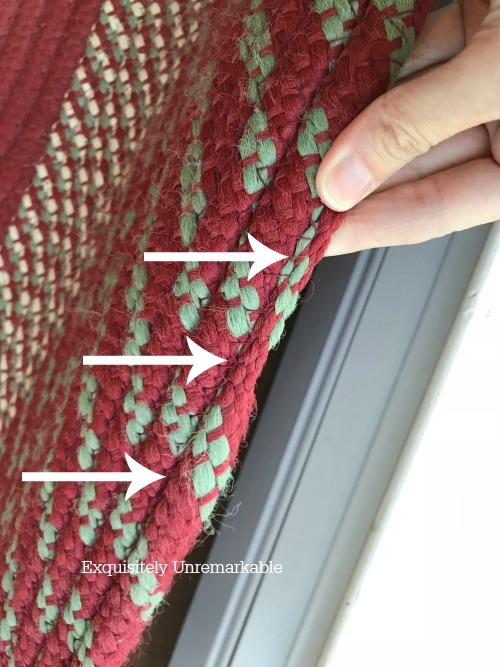 Braided rugs are constructed by taking long loops of braided textiles, laying them next to one another and stitching them together. 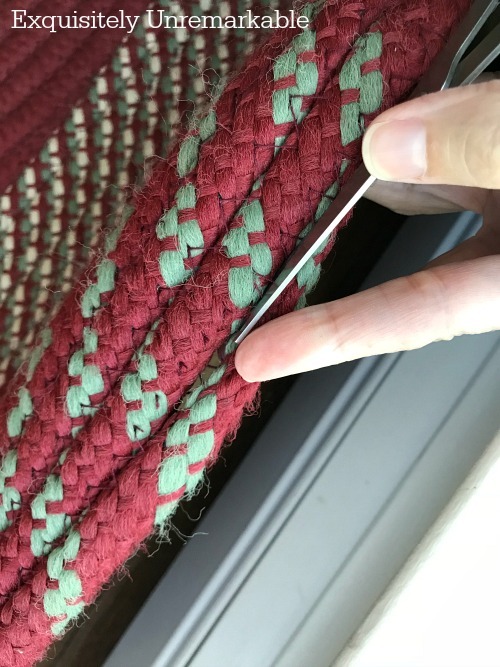 I knew that if I clipped the threads that held the braids together, I could easily remove the excess bands without having the entire rug fall apart. We started by rolling the rug out, vacuuming it off and then placing the table on top of it. The table held it in place while we worked, but it was also a visual aid. I needed it there for scale and to determine exactly what size I wanted. Next, I found the end seam. It was fairly easy to locate, it tapered off at the end. This was where I started cutting. 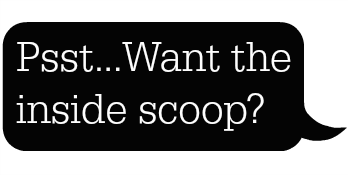 I grabbed my scissors and began to snip at the threads, gingerly at first. I wanted to make sure that my theory was correct and I wasn't going to end up with a pile of braids on my kitchen floor. But, as expected, the rug remained perfectly intact, and only the braid I had separated fell away. Success. Well, sort of. If I wanted to remove one or two braids, this would be the way to go. Since I wanted to take my 8 foot rug down to about 6.5 feet, it would be a slow process. And we didn't have time for slow. That's when the mister stepped in. He grabbed a razor blade (we could've done it with scissors, too) and began cutting several braids in. It was quick work. How quick? You can peek at the video if you want to see him cut in real time. After we'd removed about 6 inches of braids, we put the chairs on the rug to get a feel for how it would work. It was still too big for my taste. So we removed more. In the end, we removed that entire outer red and green band. Then I pulled out all of the leftover cut threads. Since they weren't anchored to anything, they just pulled right out. Lastly, I grabbed a needle and thread to tuck in and stitch the end, which by the way was already pretty secure. It was more of a cosmetic fix than a structural one. That's it. 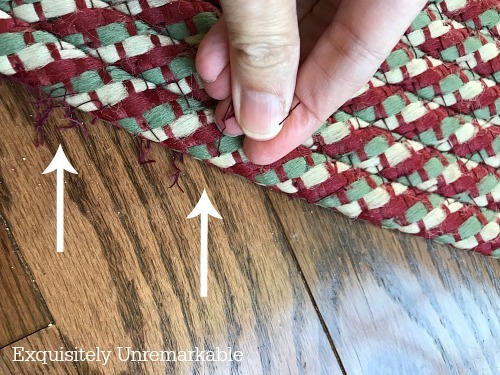 That's all it took for me to get a brand new, custom sized braided rug in my kitchen. We completed the job in about 20 minutes, including vacuuming up the loose threads and tossing the old braids in the trash. Plus it didn't cost me a dime. I love a cheap and easy fix. Would you cut a rug? You go girl with cutting the rug. That is great and I love it smaller. Looks awesome. Your hubby did a great job. Great job! I've always loved braided rugs. Once I crocheted one out of fabric. My daughter is learning to crochet right now, Brenda. I hope she teaches me so maybe one day I can make my own as well. No cutting necessary!! This is fantastic! This is so great if I find a rug at a yard sale and it's too big or the outer bands are damaged. 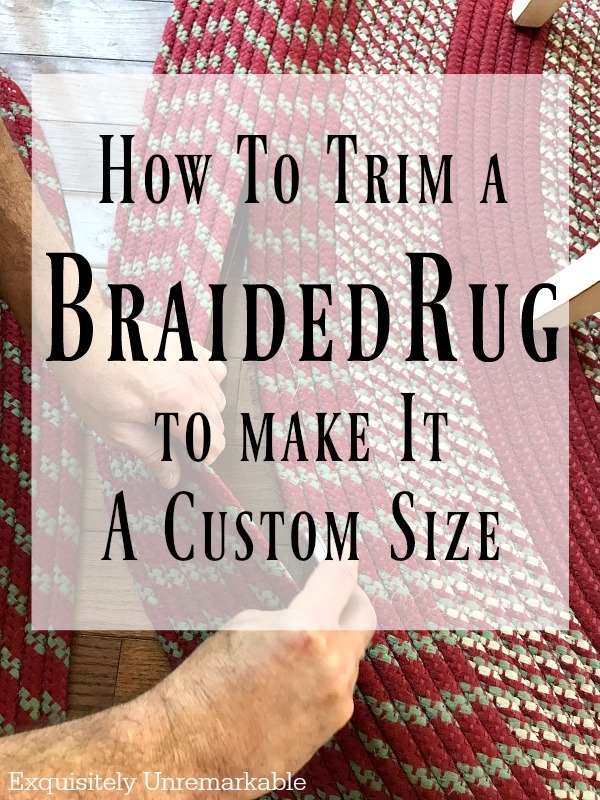 I love braided rugs and have several and want more but have no room for them. 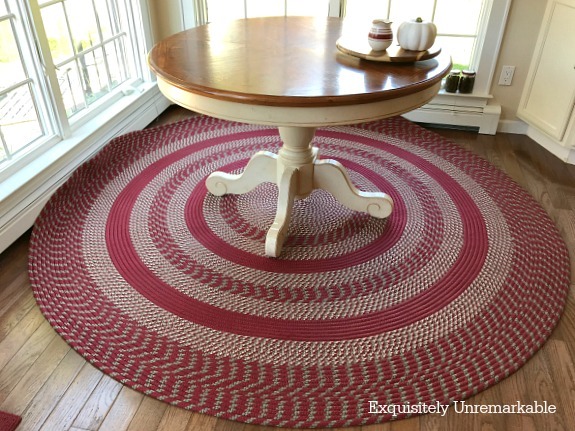 IMO they are the perfect rugs and go with anything, traditional, colonial, cottage, all the way to even modern. SO glad you found this DIY helpful, Dawn! 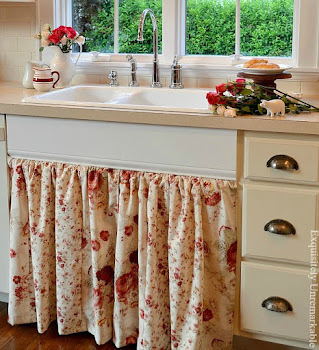 I looked all over the internet and couldn't find a way to cut, so I dove in....and yes, totally agree, they are perfect in any room, any decor. 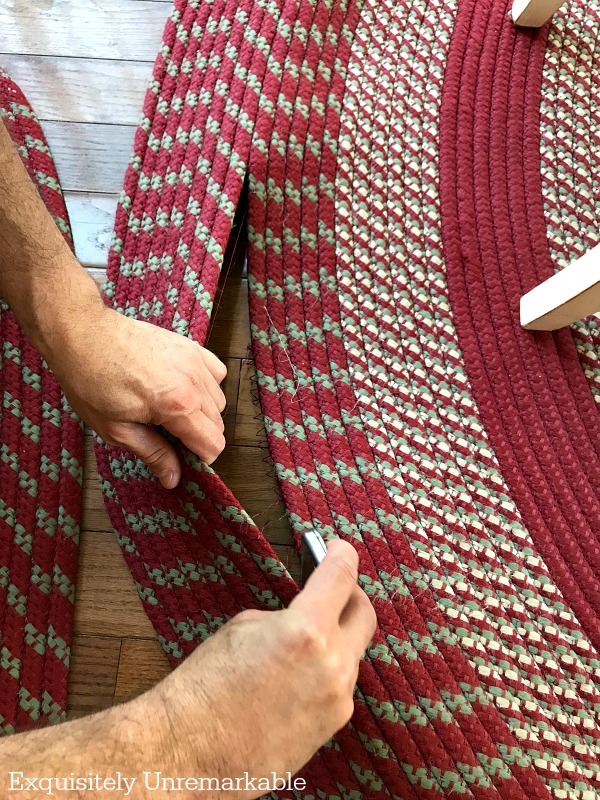 Here's to braided rugs! Looks SOOO much better smaller and without that heavy outer band. Great job! (both of you) Yes, ma'am, I would cut a rug if the occasion presented itself. My theory would be that I already didn't work, what's it gonna hurt?? Thanks Nancy! And yup, those were my sentiments exactly!! 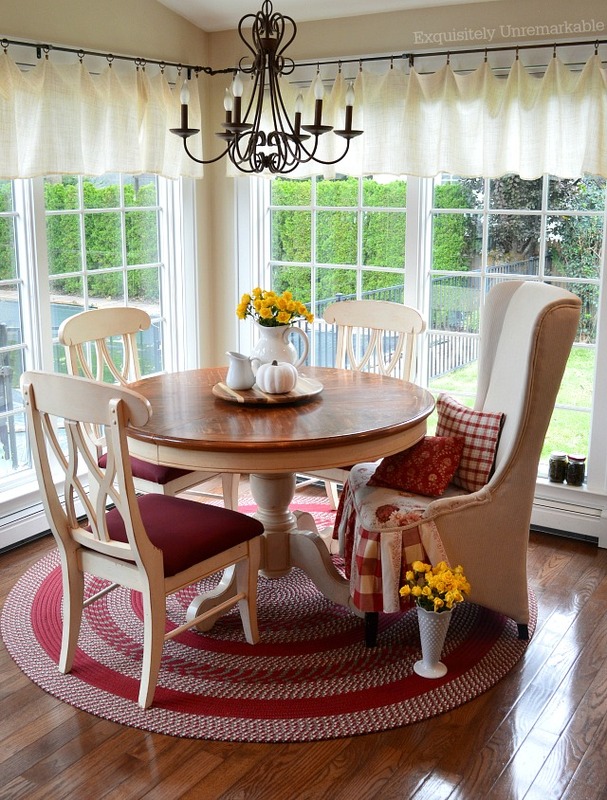 Your rug downsized is perfect for the table and chairs. Great idea! Thanks Laura!! I have to admit, I was worried about how the chairs would work, but we tested it out as we cut to make sure it was appropriate. Thanks so much for the comment. Happy Fall!! Thanks Deanna! Most things are easier to take apart than they are to put together…so it was easy! Ha! Wow, I'm glad to know about that! I too love braided rugs, and I have one right now I was thinking of getting rid of b/c it's too big. Voila, I'm going to do this! Thanks for the vision! Florence, this one sat in the basement for the same reason. And then I got tired of looking for one. You'll have to let me know if you try it!! And nice to hear from you! Hi Kim, wow I am totally amazed at what the two of you can do together. The rug looks great. 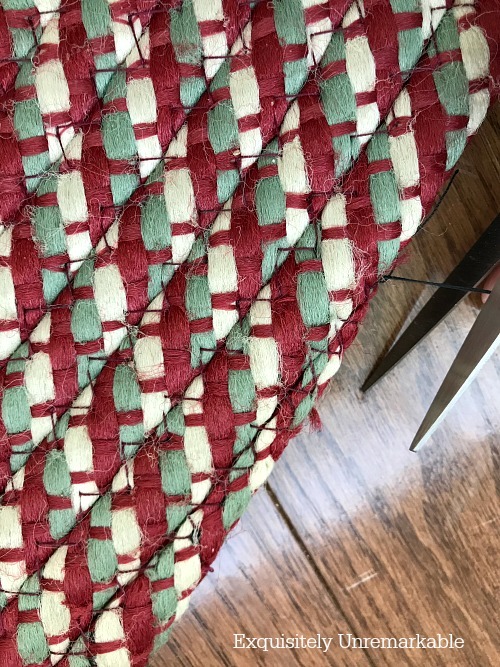 We grew up with braided rugs my aunt used to make by hand. Thanks Julie! It really helps to have a handy partner. Two heads are way better than one…especially when one has tools and knows how to use them!! I love braided rugs. I would never have thought you could trim them. How great it that? I didn't either, Penny! My mom used to say that necessity is the mother of invention, but in my case it was desperation!! 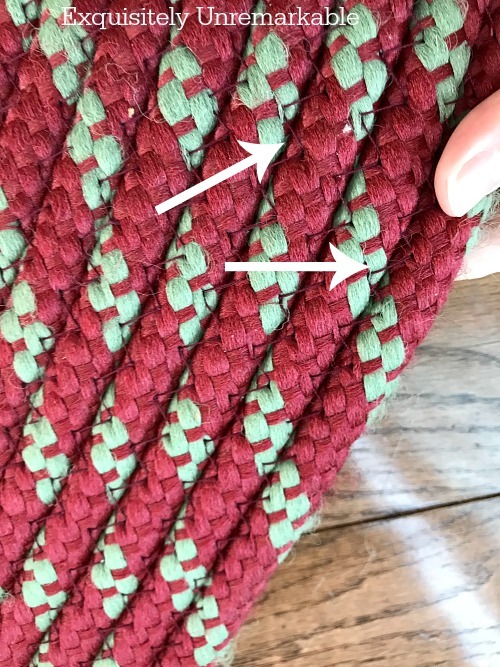 We had braided rugs all over our house when I was growing up. I hated them but as I got older, I had them in my home as well and really liked them. I never knew you could cut them down...how cool! Looks great and I love the new size! Love and hugs to you sweet friend! Thanks Benita! My mom had wall to wall carpet, beads hanging in the kitchen and a mirrored wall when I was growing up and I loved it. My aunt was the queen of all things country and braided rugs ruled. I thought it was stuffy and old fashioned. Um...Funny how things change isn't it? And hugs right back to you. Glad to see you pop up in the comments again! Your new old rug looks great! Isn't it funny how the things we say we'd never want in our homes, always find their way in once we get a little older? :) Your conversation with the big guy sounds a lot like the kind I have around here. Who would think this would work . . . Thanks Lynne. I guess my mind was wired for crazy DIY schemes!! That is scary stuff but once again you and hubby pulled it off! It looks great! Thanks AnnMarie! I was pretty confident that it'd work...but that first cut was scary! We had a few of those rugs in our house growing up too, but always oblong. I love that you were able to resize it so easily. 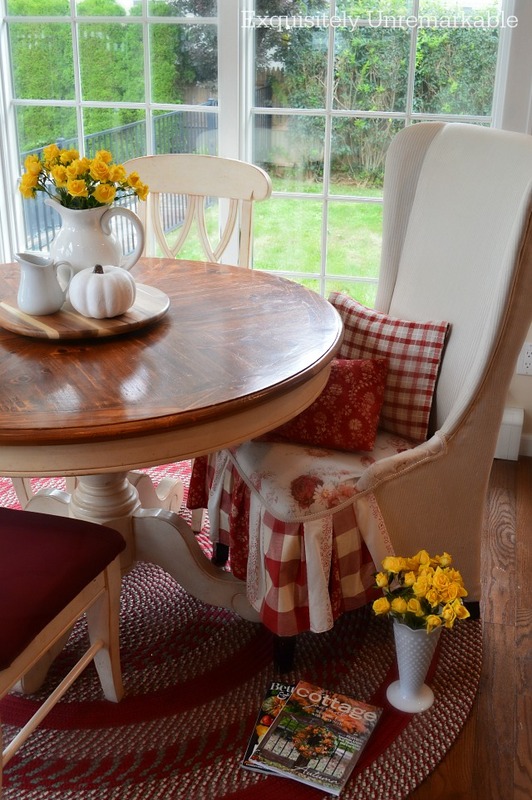 It looks great in the dining room, and perfect with your lovely wing-back chair too. Thank you, Toni. I'm glad we were able to make it work. I feel like I have a brand new rug now! It looks great. Love the conversation .. :-) between you two. I love how you resized your rug, it looks lovely and fits the room perfectly. The corner with the rug looks super cozy, soft and warm. Thank you for sharing the resizing process, it's quite useful. And you're right, nothing can beat the softness of a gorgeous rug. I'm wondering, how would you feel when it comes to hemp rugs, considering your allergies? I've never thought about a hemp rug, Katarina. I would have to look into it, but it would be nice to have other options for sure. And thanks! The room feels fall ready now. I appreciate the visit and the thoughts! Great idea and I love free! 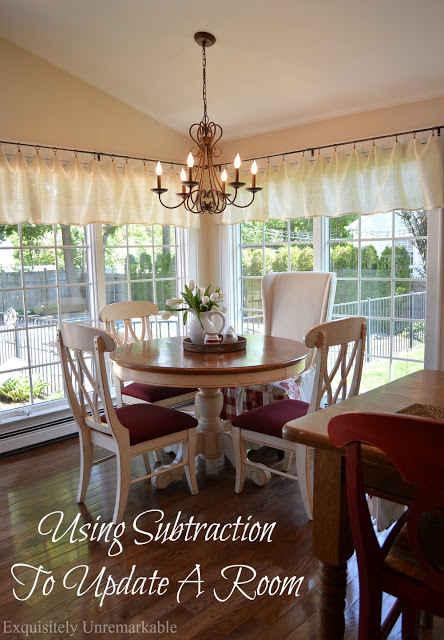 It looks perfect under your dining table and chairs. Thanks Kristi. I love it. Brilliant work Kim. And it looks perfect for the area now! And I believe you when you say it was super easy!